Aim: Chronic suppurative otitis media (CSOM) is a common cause of hearing impairment, especially in rural population. This study was carried out to know about the bacterial flora and antibiotic sensitivity for better management of the disease and to reduce morbidity due to CSOM. Materials and Methods: This study was undertaken in a tertiary care center of western UP with an aim to study the bacterial flora and their sensitivity to a series of antibiotics in cases of CSOM (unsafe) with active purulent discharge. There was no history of topical or systemic antibiotic therapy in these patients in the last 3 months. Aural swabs were taken and cultured for aerobic bacteria. For cases showing growth on culture media, sensitivity for a series of antibiotics was studied to have an understanding of the antibiotics showing sensitivity and resistance. Results: A total of 62 (mean age 17.38 years) diagnosed cases of CSOM unsafe were included in the study. The study group included 38 males (61.29%) and 24 (38.71%) females. Fifty-four patients (87.09%) had unilateral diseases, while 8 patients (12.90%) had bilateral diseases. 94.28% of the ears showed growth on culture media. Majority of these ears showed monomicrobial growth (90.90%). Conclusion: The most common bacteria isolated in descending order were Pseudomonas, Klebsiella, Staphylococcus, Proteus, and Escherichia coli. Majority of the patients showed sensitivity to cefoperazone and salbactum (90.69%), ofloxacin (79.06%), and ciprofloxacin (79.06%). 95.35% of the patients showed resistance to amoxicillin. Knowledge of the common causative organisms and their antibiotic sensitivity is helpful in deciding the drug of choice in perioperative management of unsafe CSOM. The purpose of the present study was to determine the type of bacteria associated with CSOM (unsafe type). Further, antibiotic susceptibility of bacteria was also studied for a series of antibiotics to study the antibiotic resistance. This study was undertaken in a tertiary care center of western UP with an aim to study the bacterial flora and their sensitivity to a series of antibiotics in cases of CSOM unsafe. Diagnosed cases of CSOM unsafe. Active purulent discharge at the time of examination. Cases with CSOM Tubo-tympanic disease, Acute suppurative otitis media, otomycosis, or otitis externa were excluded from the study. No history of topical or systemic antibiotic therapy in the last 3 months. Aural swabs were collected from the affected ear (after cleaning external auditory canal with spirit swab) of the patients before starting medical treatment. Due care was taken to avoid contamination while collecting pus from ear. In cases with bilateral disease, ear swabs were taken separately from both the ears. The swabs were processed for aerobic bacteria using standard microbiological procedures. All cases showing growth on culture media after 72 h of inoculation were subjected to culture and sensitivity for the commonly used antibiotics. A total of 62 patients were included in the study. The mean age of the patients was 17.38 years, with the peak age group between 11 and 20 years. Majority of the patients (76%) were less than 20 years of age. 61.29% of the patients were males, while 38.70% of the patients were females [Table 1]. The male:female ratio in our patients was 1.58:1. Fifty-four (87.09%) patients had unilateral disease, while 8 (12.90%) patients had bilateral disease. For the purpose of analysis, results are presented as the number of ears (70 ears). [Table 2] shows the results of culture in 70 ears of CSOM (unsafe). 5.72% of the ears showed a sterile culture after 72 h, while 94.28% of the ears showed growth. Of the ears showing growth, 90.90% showed monomicrobial growth while 9.09% of the cases showed polymicrobial growth. [Table 3] shows the common microbes encountered in growth in ears with monomicrobial growth. The study population showed the following microbes in descending order: Pseudomonas, Klebsiella, Staphylococcus, Proteus, and Escherichia coli [Table 3]. In cases with ear swab showing polymicrobial growth, Pseudomonas, Staphylococcus, and Klebsiella were commonly associated (4/6). [Figure 1] shows antibiotic sensitivity in 66 ears of unsafe CSOM (as 4 patients showed no growth after 72 h). Majority of these patients showed sensitivity to cefoperazone and salbactum (90.69%). Ofloxacin (79.06%) and ciprofloxacin (79.06%) were almost equally effective. Majority of the patients showed resistance to amoxicillin (95.35%). CSOM is characterized by recurrent ear discharge and gradually progressive conductive hearing loss. It is particularly common in lower socioeconomic status and rural population. , Unsafe CSOM is characterized by an attic cholesteatoma or a posterosuperior cholesteatoma with a history of scanty foul-smelling ear discharge (at times blood stained) and deafness. Cholesteatoma is keratinizing stratified squamous epithelium and an accumulation of desquamating epithelium of keratin within the middle ear or other pneumatized portions of the temporal bone. It may or may not be associated with infection; when infection is present, it can be acute or chronic. Frequently, a cholesteatoma is present in the middle ear and without any signs of acute or chronic infection. However, when infection is present, it can involve the entire middle ear cleft. Untreated and poorly treated CSOM results in a variety of complications, e.g. mastoiditis, facial nerve palsy, meningitis, and brain abscess. Cholesteatoma usually causes bone resorption, which is thought to be secondary to pressure erosion as the mass enlarges or possibly due to the activity of collagenase. The treatment of choice is mastoid exploration under perioperative antibiotic cover. Klebsiella was the second most common microbe isolated in these cases with unsafe CSOM. Fairbanks  reported Staphylococcus as the second most common cause. Vijaya et al. in 250 cases found the most common isolates were Staphylococcus aureus, followed by Klebsiella. Lee  reported that the predominant organisms in CSOM are gram-positive bacilli and anaerobic organisms. He reported Pseudomonas as the most common aerobic bacteria cultured and Bacteroides fragilis as the most common anaerobic bacteria cultured in cases of CSOM. Anaerobic culture was not done in our case series. In our study, Klebsiella and Proteus were isolated from 18.33% and 20% cases of unsafe CSOM, respectively. E. coli was isolated from 3.33% of ears. Lee  reported that Proteus and E. coli are also frequently encountered. The sensitivity to a series of antibiotics showed that majority of the patients showed sensitivity to cefoperazone and salbactum (90.69%); other equally effective antibiotics were ofloxacin (79.06%) and ciprofloxacin (79.06%). 95% of ears showed resistance to amoxicillin (antibiotic resistance). This appears to be due to injudicious use of antibiotics and antibiotic resistance. Brook  reported that approximately 60% of aerobic bacteria in CSOM are beta-lactam producing organisms. In a study conducted by Indudharan et al., they found that sensitivity to ceftazidine was 100%. Yang et al. found Pseudomonas to be the most common organism in CSOM and its sensitivity rate of ciprofloxacin was 89%. Similarly, Sharma  found that all the isolated organisms were sensitive to ciprofloxacin and ofloxacin, while most isolates were resistant to amoxicillin. Polymicrobial growth was seen in 6.89% of the cases. Kuchhal  found Staphylococcus and Pseudomonas to be the most common organisms isolated. 76.92% were sensitive to ceftazidime, 69% were sensitive to amoxyclav combination, while 57% were sensitive to ciprofloxacin. Most chronic ear discharge results from mixed infections with both aerobic and anaerobic pathogens. But isolated B. fragilis is becoming more common. Brooks and Santosa  reported mixed infections in 69% of cases. They reported P. aeruginosa and Proteus species as the most commonly identified aerobic bacteria, and Bacteroides and Peptostreptococcus as the most commonly found anaerobic organisms. Our study was conducted only for aerobic bacteria. An understanding of the common pathogens involved in active unsafe CSOM, culture and sensitivity for antibiotic and antibiotic resistance helps us in making a correct choice of antibiotic. The aim of treatment in cases of unsafe CSOM is to control infection and eradicate the disease (Mastoid exploration). Judicious use of antimicrobials in preoperative and postoperative period in these patients decreases the incidence of postoperative infection. A total of 70 ears with unsafe CSOM were included in the study, with the mean age of the patients being 17.38 years. The study group included 61.29% of males and 38.71% of females. The male:female ratio was 1.58:1. Majority of the patients were in the age group of 11-20 years (53.22%). Fifty-four patients (37.09%) had unilateral disease, while 8 (12.90%) patients had bilateral disease. 94.28% of ears with unsafe CSOM showed growth, Majority of the ears showed monomicrobial growth. The most common bacteria isolated in descending order were Pseudomonas, Klebsiella, Staphylococcus, Proteus and E. coli. Majority of the patients showed sensitivity to cefoperazone and salbactum (90.69%) ofloxacin (79.06%) and Ciprofloxacin (79.06%). 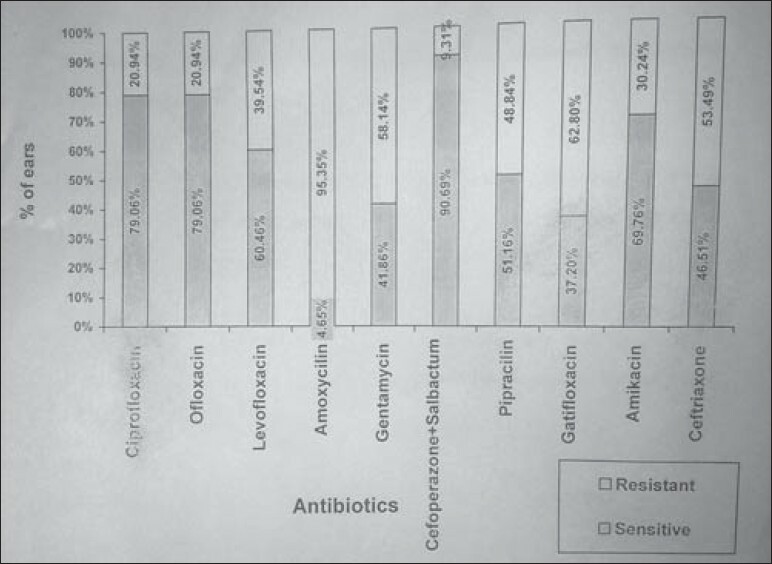 (95.35%) of patients showed resistance to amoxicillin. 1. Arguedas A, Loaiza C, Herrera JF. Antimicrobial therapy for children with chronic suppurative otitis media without cholesteotoma Paediatr Infect Dis J 1994;13:878-82. 2. Attalah MS. Microbiology of chronic suppurative otitis media with cholesteotoma. Saudi Med J 2000;21:924-7. 3. Fliss DM, Dagan R, Meidan N, Leiberman A. Aerobic bacteriology of chronic suppurative otitis media without cholesteotoma in children. Ann Otol Rhinol Laryngol 1992;101:866-9. 4. Anifasi WB, Tumushime - Buturo CG. Bacteriology and drug sensitivity of chronic suppurative otitis media in central hospital in Zimbabwe. Cent Afr J Med 1989;35:481-3. 5. Fairbanks D. Pocket Guide to antimicrobial therapy in Otolaryngology - Head and Neck surgery. In: Alexendria VA, editor. 8 th ed. The American Academy of Otolaryngology -Head and Neck surgery Foundation. 1996. p. 1-91. 6. Lee KJ. Infections of the ear Essential Otolaryngology Head and Neck Surgery. VII edition. Mc Graw Hill. 1999; p. 677-8. 7. Sharma S, Rehan HS, Goyal A, Jha AK, Upadhayaya S, Mishra SC. Bacteriological Profile in Chronic suppurative otitis media in Eastern Nepal; Trop Doct. 2004;34:102-4. 8. Indudharan R, Haq JA, Aiyar S. Antibiotics in chronic suppurative otitis media: a bacteriologic study. Ann Otol Rhinol Laryngol 1999;108:440-5. 9. Karma P, Jokipii L, Ojala K, Jokipii AM. Bacteriology of the chronically discharging middle ear. Acta Otolaryngol 1978:86:110-4. 10. Goyal R, Aher A, De S, Kumar A. Chronic suppurative otitis media - A Clinico-Microbiological study. Indian J Otol 2009;15:18-22. 11. Kuchhal V. Antibiotic sensitivity pattern in chronic suppurative otitis media in kumoun region. Indian J Otol 2010;16:17-21. 12. Taneja M, Taneja MK. CSOM a bacteriological study. Indian J Otol 2009;15:3-7. 13. Taneja MK. CSOM a bacteriological study. Indian J Otol 1995;I-2:24-7. 14. Malkappa SK. Study of aerobic bacterial isolates and their antibiotic susceptibility pattern in chronic suppurative otitis media. Indian J Otol 2012;18:136-9. 15. Vijaya D, Nagarathnamma T. Microbiological study of chronic suppurative otitis media. Indian J Otol 1998;4:172-4. 16. Brooks I, Burke P. The management of acute, serous and chronic otitis media: The role of anaerobic bacteria. J Hosp Infect 1992;22 (Suppl A):75-87. 17. Yang Y, Gong S, Liu Y. The clinical investigation of bacteriology of chronic suppurative otitis media. Lin Chuang Er Bi Hou Ke Za Zhi 2001;15:550-2. 18. Fairbanks DNF. Pocket guide to antimicrobial therapy in otolaryngol, Am Academy of otolaryngology Head and Neck Surgery. Washington DC: 1983. p. 5-8. 19. Brooks I. Aerobic and Anaerobic bacteriology in cholesteotoma. Laryngoscope 1981;91:250-3. Prakash, M., Lakshmi, K., Anuradha, S., Swathi, G.N.